I show that decentralizing the optimal allocation requires not only high carbon prices but also fundamental changes to tax policy: If the government discounts the future less than households, implementing the optimal allocation requires an effective capital income subsidy (a negative intertemporal wedge), and, in a setting with distortionary taxation, an effective labor-consumption tax wedge that is decreasing over time. Second, if the government cannot subsidize capital income, the constrained-optimal carbon tax may be up to 50% below the present value of marginal damages (the social cost of carbon) due to the general equilibrium effects of climate policy on household savings. Third, given the choice to optimize either carbon, capital, or labor income taxes, the socially discounting planner’s welfare ranking is ambiguous over a standard range of parameters. Overall, in general equilibrium, a policy-maker’s choice to adopt differential social discounting may thus overturn conventional recommendations for both environmental and fiscal policy. That is from her discount rate paper. The broader lesson here is that all your intuitions about climate change, discount rates, and taxes might not hang together. Do not follow mood affiliation, rather think the issues through carefully. For the pointer I thank the excellent KL. Here are other papers by Lint Barrage. This is a time when we need new ideas for policy. We think economists, among other social scientists, have a responsibility to be part of the solution, and that mainstream economics – the kind of economics that is practiced in the leading academic centers of the country – is indispensable for generating useful policy ideas. Much of this work is already being done. In our daily grind as professional economists, we see a lot of policy ideas being discussed in seminar rooms, policy forums, and social media. There is considerable ferment in economics that is often not visible to outsiders. At the same time, the sociology of the profession – career incentives, norms, socialization patterns – often mitigates against adequate engagement with the world of policy, especially on the part of younger academic economists. Are workers exploited in the Chinese manufacturing sector? Many news outlets and scholars have expressed concerns that workers have been unfairly exploited by employers in the Chinese manufacturing sector. Economic theory suggests that this exploitation, if it exists, is the result of employers in the manufacturing sector having considerable monopsony power. While there is a vast economic literature on monopsony power in the United States and other nations, little monopsony research has been conducted on the Chinese manufacturing market. This paper follows the monopsony research tradition and examines the Chinese manufacturing sector along several likely indicators of monopsony power. These include the turnover rate in the manufacturing sector, the relation between marginal factor cost and average factor cost, the relation between average real labor productivity and real wage in the manufacturing sector, and the comparison of labor costs between China and other countries. This study found that worker exploitation/monopsony in the manufacturing sector is not as severe as previously reported. Here is the paper, by Linan Peng and Joshua Ingber, both of GMU, via the excellent Kevin Lewis. [In Calvano et al. 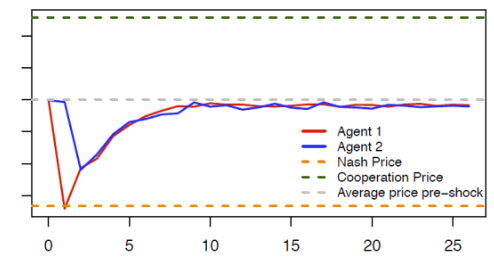 2018a] we construct AI pricing agents and let them interact repeatedly in controlled environments that reproduce economists’ canonical model of collusion, i.e. a repeated pricing game with simultaneous moves and full price flexibility. Our findings suggest that in this framework even relatively simple pricing algorithms systematically learn to play sophisticated collusive strategies. The strategies mete out punishments that are proportional to the extent of the deviations and are finite in duration, with a gradual return to the pre-deviation prices. …The collusion that we find is typically partial – the algorithms do not converge to the monopoly price but a somewhat lower one. However, we show that the propensity to collude is stubborn – substantial collusion continues to prevail even when the active firms are three or four in number, when they are asymmetric, and when they operate in a stochastic environment. The experimental literature with human subjects, by contrast, has consistently found that they are practically unable to coordinate without explicit communication save in the simplest case, with two symmetric agents and no uncertainty. What is most worrying is that the algorithms leave no trace of concerted action – they learn to collude purely by trial and error, with no prior knowledge of the environment in which they operate, without communicating with one another, and without being specifically designed or instructed to collude. Tacit collusion isn’t actually illegal since it’s virtually impossible to prove, at least among humans. Tacit collusion by AIs is going to be much more common but perhaps also easier to prove if the antitrust authorities can demand access to the algorithms. No need to torture the data when you can torture the AIs. It’s going to be a strange world.